The Innovationsforum Interaktionsdesign was a two-day conference that Steffi Hußlein and I organised during the Winter of 2006 / 2007. It was held on the 30th and 31st March 2007 in the new home of the Hans Otto Theatre Potsdam. The aim of the conference was to focus on all aspects of interface and interaction design: mobile telephone and media interfaces, problem solutions und product visions, web pages and virtual worlds, art und commerce, business and science. The conference was financed by the Federal German Ministry of Education and Research’s fund for »Interregional Alliances for Tomorrows Markets«. Using both concrete projects and visionary concepts, current developments in interaction design were presented and discussed by regional and international experts from the design, research and business worlds. The conference was a great success. Over 500 international guests attended the conference. All presentations during the conference were filmed videotaped and are now available on the conference website. Gillian Crampton Smith, Anthony Dunne, Tim Edler, Frank Jacob, Gesche Joost, Bernard Kerr, Patrick Kochlik, Kristjan Kristjansson, Bill Moggridge, Dennis Paul, Mike Richter und Bruce Sterling. In addition, new student projects on interface and interaction design were presented by student teams from six European universities. 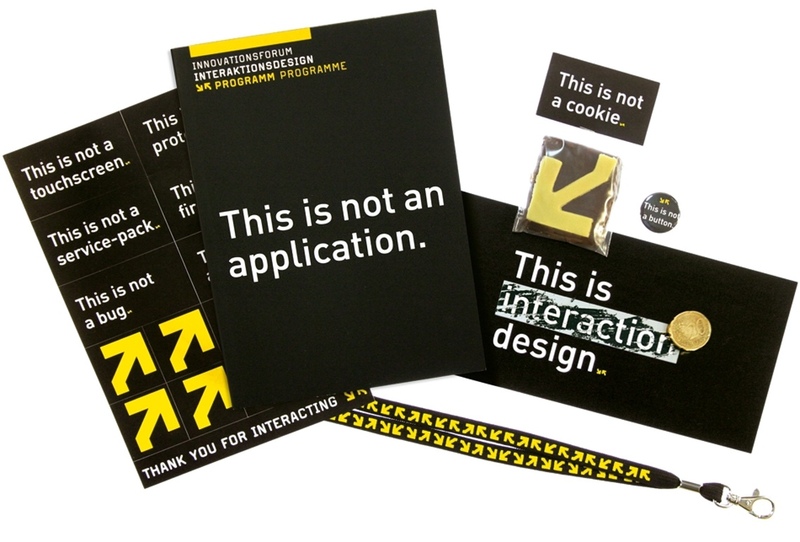 The design of the conference was created by the Berlin-based design agency Formdusche. The design was awarded with an iF-Award and was nominated for the “Designpreis der Bundesrepublik Deutschland”, the highest design award in Germany.